There’s no question that rock & roll was created in the fifties. 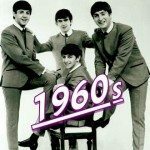 The sixties was known as the decade of the British bands and the changes they brought to the genre. The early part of the sixties, much like the previous decade was a continuation of the doo-wop sounds and soulful ballads that had led the charts. The British invasion lent itself to a new sophistication in popular music sort of a rock with an international flavor. As the period progressed the music took on the undertones of the social unrest and defiance that drove the youth of the time. From hard rock to folk anthems music was all about discontent, with war in Vietnam, with the establishment, of the status quo in general. Lets start with the first 3 or 4 years prior to the British invasion which was a continuation of the later half of the 1950’s rock and doo wop era. The baby boomers were now teenagers and they loved to dance. Television shows like American Bandstand helped to promote new dance styles like the Twist, the Swim, the Locomotion, the Mashed Potato and others. These dance crazes were usually loosely veiled marketing attempts to promote a song about the particular dance. Enough probably can’t be said about American Bandstand’s influence on the popularity of these dance songs, the show needed ways to keep viewers tuned in with fresh material and the record companies wanted the exposure, it was a marriage made in heaven. 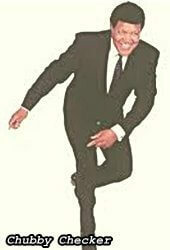 Chubby Checker in 1960. It’s popularity was no doubt enhanced by the hugely successful dance. Checker also released the song titled “Pony Time” and the corresponding dance the Pony. Other artists with popular dance songs were Dee Dee Sharp and James Brown each had their own version of Mashed Potato and Bobby “Boris” Pickett did “The Monster Mash”. While the dance craze contributed a significant number of chart toppers, ballads were still ruling the day. Connie Francis was perpetually on top with songs like “My Heart Has A Mind of It’s Own” and “Where the Boys Are”, the Everly Brothers held top spots with “Cathy’s Clown” and “Wake Up Little Susie”. Elvis reemerged from the Army in 1960 with “It’s Now or Never” and “Are You Lonesome Tonight”, instant hits of course but what was new was having to compete with Girl Groups for air time. Groups like the Shirelles, the Ronettes, the Marvelettes and the Chiffons became a force of nature that although short lived contributed many hits. By 1963 Bobby Vinton was still belting out covers and the Beach Boys were the new and upcoming group. Then everything started to change. In response to a very well coordinated marketing campaign teenagers began paying attention to some new sounds coming out of Liverpool, U.K. In late ’63 “I Want To Hold Your Hand” had sold one million copies before it was released and was the first song the Beatles wrote entirely for America. It was released to coincide with the their arriving in the U.S. February 07, 1964. The British invasion was actually started by a bootlegged version of “I Want To Hold Your Hand” being played on a Washington DC radio station. The ground swell of demand to hear this new kind of song forced Capital Records to release the single three weeks ahead of schedule. Dusty Springfield was a British musician who was already making inroads into the American market before the Beatles arrival but it was Beatlemania that started in the U.K. and spread across the U.S. that is acknowledged as the catalyst for the invasion. Once the flood gates were opened by the Beatles Americans couldn’t get enough of British bands. Groups like The Animals, Herman’s Hermits, Manfred Mann, Donovan, Petula Clark, Freddie and the Dreamers, Wayne Fontana and the Mindbenders and The Rolling Stones dominated the charts with their fair share of #1 hits. The music of the British groups that had gone to America also dominated the airwaves in the UK. Music wasn’t the only thing that came across the pond, America craved all things British especially fashion. London took over as the epicenter of the fashion world with designs flooding out of Carnaby Street and Kings Road shops. 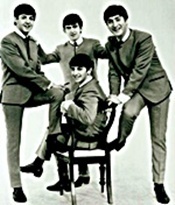 None of the other British bands could ever come close to what the Beatles achieved in the 6 short years that they performed as a group, with the highest number of albums at #1, the longest amount of times at #1, staying #1 the longest, having the most singles in the top 10 at one time and countless other milestones. The influences that the British bands had on American music were permanent. Acts that were holdovers from the 1950’s slowly faded away, even Elvis’s chart success was sidelined by this new breed of musician. Typically American genres like surf and hotrod music did manage to flourish but embodied elements of R&B and mersey beat both found in the new British rock & roll. The later half of the sixties saw rock & roll transform itself into a tool for social change. Anything that was status quo was a target for protests and the music reflected those sentiments. Not just rock screamed out change, so did folk music and even pop took up the banner. Groups like the Jefferson Airplane, Grateful Dead and the Who dominated a new genre called psychedelic rock which was influenced by the heavy drug usage of the day. The best medium to portray the anti-establishment sentiment of the day seemed to be the new pop/folk sounds. Leaders in this category were Bob Dylan, Peter, Paul and Mary, The Mama’s and the Papa’s and later in 1969, Crosby, Stills, Nash and Young. These groups paved the way for the more heavy rockers like Janis Joplin and Jimmi Hendrix. Groups who were also in the heavy metal genre were Led Zeppelin, Cream and Iron Butterfly. Musical styles were blending together with unusual outcomes. Rockers performed folksy ballads while heavy metal was applied to classical tunes. A good example of this was the Moody Blue’s 1967 album Days of Future Passed. For more in depth info, history and song charts visit each year from the below chart.